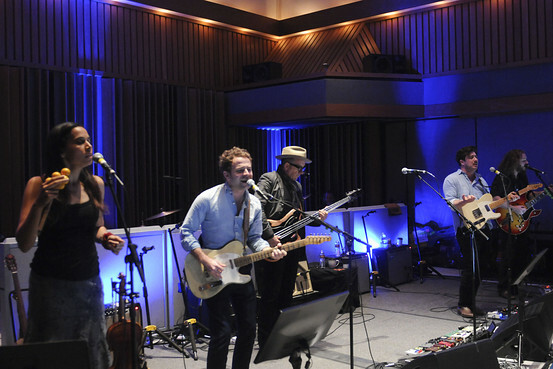 Recording artists Rhiannon Giddens, Taylor Goldsmith, Elvis Costello, Marcus Mumford and Jim James of the New Basement Tapes perform On SiriusXM at Capital Studios. An all-star band that released its debut album this week has already played its final show. The New Basement Tapes – a group assembled to put music to a trove of recently discovered Bob Dylan lyrics – serenaded a couple dozen Sirius XM satellite radio subscribers at an intimate concert on Friday. During the session, held in a recording studio in Hollywood ‘s circular Capitol Records building, the band members also answered questions about how they approached the daunting task. The reclusive Mr. Dylan, 73 years old, blessed the project, and his music publisher sent the lyrics to producer T. Bone Burnett. Nonetheless, some of the musicians said they were initially overwhelmed by the pressure of trying to write Bob Dylan-quality songs, and tried not to think about how Mr. Dylan would have sung them himself. “We had to put it out of our heads, and we did what Bob Dylan would do: not think twice,” said Taylor Goldsmith, of the folk-rock band Dawes, explained during the performance. Each of the ensemble members – which include Elvis Costello, Mumford & Sons singer Marcus Mumford, My Morning Jacket’s Jim James and the Carolina Chocolate Drops’ Rhiannon Giddens– studied the songs and prepared their own melodies before convening for a two-week writing and recording session at the Capitol tower earlier this year, though some did less prep work than others, as Mr. Mumford admits on a documentary film airing on Showtime this fall. The title is a reference to Mr. Dylan’s original “Basement Tapes,” an album he spontaneously recorded in 1967 in the basement of his Woodstock, N.Y., home with the musicians that went onto form the Band. On Friday, the New Basement Tapes members also discussed when their own love affairs with Mr. Dylan’s music began. Mr. Costello said his Dylan obsession was sparked by one of his old girlfriends’ buddies, “one of those dramatic girls who liked to cry a lot and listen to Cat Stevens.” Probably just to look cool, he said, she used to tote around a copy of Mr. Dylan’s “Blonde on Blonde” record. “I don’t think she ever listened to it,” Mr. Costello said, but he was nonetheless intrigued. So what does Bob himself think of the album? The question drew an awkward silence from the temporary bandmates. “Bob who?” Mr. Mumford finally joked. Larry Jenkins, a media consultant to Mr. Dylan who served as executive producer of the film and album, fielded the question after the fans dispersed. The New Basement Tapes – a group assembled to put music to a trove of recently discovered Bob Dylan lyrics – serenaded a couple dozen Sirius XM satellite radio subscribers at an intimate concert on Friday. Is this being broadcast on Sirius XM at some point? docinwestchester wrote: Is this being broadcast on Sirius XM at some point? According to the Los Angeles Times, yes. But the article also says it will premiere November 12 (two days before it was recorded). It really is good to see Elvis being a part of this. Just a part of it, fading into the background and then coming forward with some beautiful songs--lost on the river, etc. Great to see this joy in something new and a real sense of collaboration. Does anyone know where I can download the deluxe version without having to pay iTunes's outrageous rip off prices? Anywhere cheaper? Amazing. Just saw an add for the thing on the cnn.com website--flashing box on the right hand side. Journal: How do you sum up the enormity of what this collaborative record represents? Jim James: To all of us it just feels like a gift, like a really beautiful gift from the universe to get to work with Dylan’s lost lyrics; it feels like a gift that will last forever. J: When you were writing music for Dylan’s rediscovered lyrics, did you feel any added pressure? JJ: Yes and no. I know I can only do what I can do and that I follow my heart and try to do everything as deeply as I can, so from that perspective I know that I’ve done what I’ve done and I know that somebody’s going to hate it and somebody’s going to love it and that’s the end, that’s all that can happen. J: What was the process to decide who would write which songs? JJ: They gave us 16 songs and told us we could write all of them or none of them. I wrote eight of the 16; then they had eight more surprise songs they didn’t tell us about until we got there, and I only wrote for one of those. I wrote nine out of 24. And Taylor and Elvis wrote like 40 versions for each one. J: Do you think being a part of this effort will influence your future work? JJ: Oh definitely. You can’t play with a group of people like this and not learn so much — working with the lyrics … working with T. Bone … The whole thing has been a massive learning experience. It’s been amazing. J: Do you have a favorite track? JJ: Yeah, all mine. [Laughter] There’s no way I could choose: they’re all so different and they’re all so varied, so it’s kind of tough. Probably Taylor’s “Liberty Street” is my favorite right now. What a pleasure it was yesterday on 'official-delayed' proper release day to play the Deluxe version fine CD. Shame that the Bob usually even-more overpriced horrible-sound ripoff overshadows this nice-sounding mass-project. I buy-obtain all Bob-Costello that I can, and look forward to EC doing more. And I share Bob-Costello-about 50+ other artistes' output that cannot be purchased. Capturing the creative process onscreen is always challenging, and Showtime's "Lost Songs: The Basement Tapes Continued" at best fitfully succeeds. Built around producer T Bone Burnett's effort to produce an album based on lyrics Bob Dylan wrote nearly 50 years ago, the project explores different approaches to songwriting, but as structured by director Sam Jones, suffers from an absence of Dylan's presence, both then and now. The five artists participating do convey their passion regarding what's described as a "once in a lifetime opportunity," but the documentary provides a rather murky and narrow window into Dylan's world. Armed with that archaeological treasure trove, Burnett brings together a disparate group of marquee musicians -- Elvis Costello, Rhiannon Giddens (Carolina Chocolate Drops) Taylor Goldsmith (Dawes), Jim James (My Morning Jacket) and Marcus Mumford (Mumford & Sons) -- in what amounts to a songwriting boot camp, designed to put their stamp on Dylan's work. The results, available in a just-released album, are eclectic, and in some instances beautiful -- perhaps foremost Mumford's interpretation, even if he laments being a tortoise in terms of the speed with which he pens songs compared with the others. There's a sense of playfulness as the artists swap ideas and riffs, but also insecurity, as they work against a tight deadline at the historic Capitol Records Studios. For all that, what appears to be Dylan's indifference toward the project is keenly felt -- he's heard only in a fleeting voiceover interview -- and Jones' attempts to replicate the history of "The Basement Tapes" falls flat. Instead of delving into the balladeer's musical biography or digging up early footage to illustrate his accomplishments, the filmmakers offer grainy shots of actors to represent the era, with the Dylan figure lensed in silhouette or turned away from the camera. Not only does it feel like a reality-TV-type cheat, but it's an unnecessary one at that. That's too bad, since there's a lot to savor here, even for those who can't name more than a few of Dylan's signature songs. And while there's obviously a commercial component to the enterprise, "Lost Songs" does fritter around the edges of something truly intriguing in regard to examining different styles of artistic inspiration. As for actually finding its core, however well intentioned this effort might be, that answer's still blowin' in the wind. UNLIKE lost time, lost songs sometimes are found again. This documentary starts with several sets of lyrics Bob Dylan wrote and never recorded during his famous 1967 “Basement Tapes” sessions with the Band. Ace roots-music producer T Bone Burnett gives them to some fine contemporary musicians, including Elvis Costello and Marcus Mumford, and says go ahead, folks, turn them into songs. We don’t get any songs that are going to replace “Visions of Johanna” or “Idiot Wind” in the Dylan pantheon. What we do get, and the real reason to watch this documentary, is an inside peek at musicians in action. They play with this melody, tweak this chord, record a song and then figure out why it does or doesn’t say what they want. This wouldn’t work if we knew the songs. Since we don’t, we feel like we’re in on the creation, and even if these aren’t Dylan’s most memorable work, it’s worth hearing a song like “Lost on the River” move from start to finish. The producers also wisely realize all this whets our appetite for the real Dylan, so “Lost” intersperses music and home-movie footage from the real Basement Tape sessions. It’s mostly silent, with Dylan and the others in the garage “studio” or walking around the grounds. It’s all very evocative, creating a perfect mood for the complete “Basement Tapes” sessions that, surprise surprise, have just been released. Not a bad opening line. It's sort of stunning how Costello-ey the Lost on the River songs are. Pretty sure if we were under the understanding that they were 100% EC compositions, we'd have no idea the truth was otherwise. This is either a reference to Pete Seegar axing power lines at the Newport Folk Festival when Dylan went electric or Mr McGuinn doesn't take cable stations. The New Basement Tapes, Lost on the River - No. 23 — The all-star group's album (17,000 sold) consists of recently discovered lyrics written by Bob Dylan in the late 1960s. The act features Elvis Costello and Mumford & Sons' Marcus Mumford, among others. 'The Dylan tribute album, isn't it?' said the young fella ,with the complicated hairdo & the rows of beads around his neck, in Sister Ray records on Berwick St, London on Saturday as he sold the last copy they had of the delux edition of the cd of this. He then went on about how confusing he found the proliferation of Dylan related 'Basement' releases. I later found out that MOOT had a similar experience a few days before in the same shop. Awareness of this album in the UK seems to be fragmentary at best. Yeah, I'm not sure that the Dylan release actually helped LOTR as much as it confused things. The store I bought it at first thought I was asking for "The Complete Basement Tapes" and then when I corrected them they thought I meant the new Pink Floyd album, "The Endless River." I could not have been clearer what I was asking for but it took three tries. I think calling themselves "The New Basement Tapes" is maybe the most confusing thing about it as far as establishing an identity for them as a group. I guess there is something to it that it parallels how "The Band" calling themselves "The Band" could be confusing for people, so maybe that's appropriate. But given that Dylan has just released a new Basement Tapes box set that is getting a lot of attention, it makes it really hard to distinguish that "The New Basement Tapes" record isn't Dylan's new "Basement Tapes" release. They might as well have called themselves "The New Dylan Record" or "That Basement Tapes Thing That Just Came Out." For all of the confusing marketing, it has made it to number 63 in the UK album chart. I just watched the Showtime documentary . It's a very thorough portrayal of the project, focusing very much on the participants. At one stage one of them say the project isn't about the songs ' but the process'. The resulting album very much shows that in that it consists mostly of slight songs performed very well. Rhiannon Giddens is , as I keep saying, the standout and this film has the honesty to emphasis this (when it's not "repeatedly showing Marcus Mumford's tortuous 'artistic process' ) by regularly showing her with questioning looks as the boys fiddle with their hats & do tricks with music software. Elvis is seen being aware of the camera most of the time, wearing his hat , scarf & tinted glasses indoors. Tellingly one scene shows him & TBone going through a list of recorded songs etc., deciding what needed to be done again , not done at all, seeming to show who was calling the shots overall. There was very much an air them being the elder statesmen and no harm in that. They are seen as being very supportive and facilitating to the participants but in that little sequence they seemed very business like and consultative exclusively as a duo.Fascinating in a lot of ways. johnfoyle wrote: Rhiannon Giddens is , as I keep saying, the standout and this film has the honesty to emphasis this (when it's not "repeatedly showing Marcus Mumford's tortuous 'artistic process' ) by regularly showing her with questioning looks as the boys fiddle with their hats & do tricks with music software. Elvis is seen being aware of the camera most of the time, wearing his hat , scarf & tinted glasses indoors. The music training is really evident (in a good way) plus she has the soul side going too. Side note: I could teach these guys a thing or two about hats. hatman wrote: Side note: I could teach these guys a thing or two about hats. But can you write and record a song in an airplane bathroom?